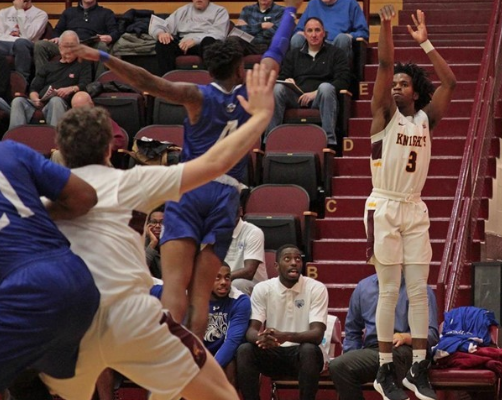 The Gannon University men’s basketball team defeated Fayetteville State in its home opener Friday but would ultimately take second place in the Gary Miller Classic, losing to Michigan Tech Saturday at the Hammermill Center. The difference in both games was the second half as a 38-26 advantage in the final 20 minutes of Friday’s Classic opener saw the Knights prevail, 70-62, against Fayetteville State. The following night, Gannon’s second half was its downfall as it was outscored 39-21 on its way to a 50-43 loss to Michigan Tech. On Friday, the Knights (2-2) fought back from a four-point halftime deficit, 36-32, and found themselves in a struggle for the first five minutes of the second half. From there, freshman standout Victor Olawoye took matters into his own hands by burying a three to put Gannon up for good, 41-40. Olawoye’s basket keyed a run that included two big Kevin Dodds layups and a pair of free throws from Cyril Ogbuagu that gave Gannon a 52-45 lead halfway through the second half. The Knights maintained at least a four-point edge the rest of the way and several times had even more breathing room. Another late Olawoye three and a flush from Ogbuagu put the lead to double digits with under a minute to play. The Broncos made a push to cut it to six, but Olawoye was 4-for-4 from the free-throw line to seal the game. Olawoye led the way with 21 points while fellow freshman Dodds added 10 of his own on 5-of-7 shooting. Ogbuagu, meanwhile, contributed eight points to go with a game-high 12 rebounds as Gannon outrebounded the Broncos, 40-28. In Saturday’s Classic title game, Gannon fell thanks in large part to a lopsided second half. The game was a tale of two halves as Gannon took a 22-11 lead into the halftime break – the lowest scoring output against the Knights since at least the 2001-02 season. But the second half was a different story, as Gannon was outscored 39-21 in the final 20 minutes. The Huskies, who shot 24 percent from the floor in the first half, did not hit a single three in the opening 20 minutes. But they opened their first possession of the second half with a three from deep, and they would hit five more the rest of the way while shooting nearly 50 percent from the floor overall. Michigan Tech methodically chipped away at the Gannon lead, and then a quick 12-0 run made it 33-29 with 10 minutes left to play, and the Huskies never looked back. Olawoye continued his double-digit scoring streak as he tallied 10 points with Kofi Mills on his heels, tallying nine points to go with nine rebounds. Up next, Gannon will play its final home game outside of Pennsylvania State Athletic Conference play Wednesday when the Knights host Bowie State in the second game of a doubleheader at 7:30 p.m. at the Hammermill Center.